This deserves a Standing Ovation! 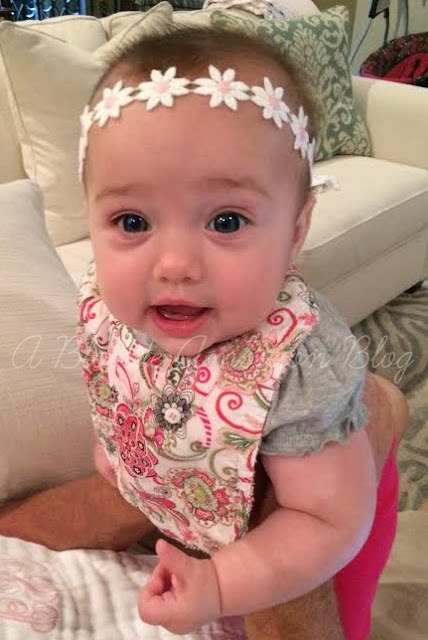 We know you're busy soaking up so much sweetness that is life so it's a gigantic pleasure reading about Miss Ainsley's Half Year! I have to admit those Mommy Notes made me blubber. If I'm ever blessed with the bebes, I hope I can relish all the time I can with them. And if God help me I can't, I know they'll be in safe hands. Hooray for a post, so good to see your pretty, well your daughter's pretty face again! I'm so glad you are home and your heart is doing better. You were on some prayer lists, lady! WOW, Ainsley is cute as button and so glad she's a good sleeper. Hope you can soak up as much baby sweet time as possible! <3 and prayers, of course! You get more than a golf clap. I am so glad that you guys are able to be together! Ainsley is gorgeous which is no surprise! Happy Six Months beautiful girl!!! You're heart must feel stronger being at home where you belong. A double broken heart (medically and emotionally) wasn't good for you. Now, that your team of doctors worked their wonder you can be home for the remainer of the healing to occur. Praying for your sweet heart every day! so glad to see a post from you, hope there is more to come as long as you are up for it of course, rest and relax as much as you need to. I cannot imagine how heartbroken you were in the hospital. That makes me sad. I'm so glad you are home and Ainsley is a doll! Oh my goodness...I had to take a double take when saw that she was six months old! What a beauty! I'm hoping that you are feeling better and will keep checking in on ya! Brings me to tears! I am so immensely happy for you to be reunited with your sweet family at long last!!!!! Such a sweet post :) she is adorable !!!! I'm so sorry for what you've missed & I can't image the sadness that goes along with it, but think of the lifetime the two of you have ahead! A bond between mommy & child is like none other! !